It is a distinction that resonates outside Hong Kong, particularly in the United Kingdom, other Commonwealth jurisdictions, and the United States. It is also a splendid reminder of the University's antiquity, and a most dignified and effective corporate identity. The grant of the coat of arms to the University occurred in two stages. On 14 May 1913, shortly after its foundation, the University was granted a shield and a motto by the College of Arms. In 1981, the year of the seventieth anniversary of its foundation, the University applied for the other components of a full coat of arms, a crest and supporters. These were granted in 1984 (the grant also included a banner and a badge). The science of heraldry has a history of nearly 800 years in Europe. Originally it served a practical need. During the thirteenth century, as a result of the introduction of the closed helmet in warfare, knights took to wearing distinctive designs on their shields so that they could be easily recognized on the battlefield. The original designs were very simple, but during the next two centuries shield designs gradually evolved into badges of noble status, and became increasingly complex. The science of heraldry developed out of the need to determine who was a noble (and thus entitled to bear a coat of arms). As nobility was in the gift of the king, the kings of England began in the fourteenth century to rely on professional heralds to adjudicate noble status, to design distinctive coats of arms, and to award them to suitable candidates. Their role was later formalized by the creation of a College of Arms. Coats of arms in Europe have long since ceased to be solely a mark of noble status, though many ancient families continue to display them with pride. They are now granted not only to worthy individuals, but also to reputable institutions. In modern Europe a coat of arms is displayed by a successful company, a city council, or a university in much the same way as a logo: as a corporate identity. Nevertheless coats of arms remain much loved and coveted. They still confer status, and have the charm of being designed according to the arcane rules of a science whose elements crystallized in the fourteenth century. Many of the terms used in heraldry are archaic French words, recalling a long-gone period when French was the language of the English aristocracy. Intricate rules govern the juxtaposition of colours. The animals, birds and other features used in heraldry have gradually acquired symbolic meanings. In designing a coat of arms, heralds can draw upon a rich vocabulary of allusion and symbolism, sanctified by eight hundred years of tradition. A coat of arms often says a great deal about the individual or institution that owns it. The shield and motto of the University of Hong Kong were granted in 1913, two years after the University's foundation. If 'read' correctly, they can tell us a lot about what its founders wanted to say about the new university. This is important, as the original records did not survive the Japanese occupation of Hong Kong during the Second World War, and the founders' intentions must be inferred from the evidence of the shield and motto themselves. The design of the shield was proposed by the University in a letter of October 1912 to the College of Arms. Sadly, it is not known who designed it: presumably a European with some knowledge of heraldry, in consultation with a Chinese scholar who suggested the Chinese quotations. In its letter the Council suggested that if more and distinctive elements were needed, it would like 'some bamboos to be introduced into the design'. The College of Arms did not take up this suggestion. An informed 'reading' of the shield and motto makes it clear that the University's founders wanted them to contain allusions to both European and Chinese culture; that they wished to express their aspirations for the new university in both a European and a Chinese idiom; and that they sought for a harmonious balance between Western and Chinese traditions-'a happy mixture of East and West' (zhongxi hebi 中西合璧). Indeed, it would be fair to say that balance is the dominating principle in the design of the shield. The shield is obviously the most prominent and important feature, and it is customary to display either the entire coat of arms or the shield and motto alone. Besides these four traditional elements, the coat of arms of the University of Hong Kong has an additional, highly unusual feature-a Chinese motto on the shield. The significance of these five distinct elements is discussed below. The shield contains a mixture of elements drawn from both European and Chinese traditions. The gold lion on a red background occupying its top third is a clear allusion to the coat of arms of England (three gold lions on a red background). In the lower part of the shield there is an open book, set against a divided background of blue and green. A book is an obvious symbol of learning, and frequently appears in the coats of arms of European universities.. The open pages of the book are inscribed with two Chinese phrases, mingde 明德 ('to manifest virtue') and gewu 格物 ("to investigate things"). Both phrases are taken from the Confucian classic The Great Learning. Both phrases are extremely appropriate for an institution of higher learning. Both in Chinese and European tradition, the function of a university is not simply to inculcate knowledge, but to train young people to become responsible members of society; or to use an older idiom, 'to manifest virtue'. Similarly, empirical investigation ('to investigate things') is the main principle of scientific enquiry. Indeed, the phrase gewu was used for a while in nineteenth-century China to translate the Western concept of 'natural science', before it gave way to the modern Chinese term for science, kexue (科學). In a word, mingde 明德 and gewu 格物 express the respective ideals of the Arts and the Sciences, the two great branches of academic knowledge. The choice of the classic The Great Learning for these texts was not fortuitous. The Chinese characters for 'Great Learning', daxue (大學), also mean 'university' in Chinese. The Chinese character ming (明) contains an extra stroke, and the character de (德) one stroke fewer than usual. This is deliberate. The characters are written in the lishu calligraphic style in vogue during the Han Dynasty, which is still used for formal inscriptions. Many coats of arms feature a motto below the shield, often in Latin or French instead of English. The motto is often a form of 'mission statement', summarising an institution's values or aspirations. Sapientia et Virtus, the Latin motto of the University of Hong Kong, is best translated 'Wisdom and Virtue'. Both Latin words have a long history of usage in philosophical literature. They were popularised by the Roman statesman and philosopher Cicero in the first century BC as suitable Latin renderings of the Greek words sophia (wisdom) and aretē (virtue), and are key terms in later Latin philosophical discourse. For the educated European reader, the two Latin terms recall more than two millennia of classical scholarship and (like the Chinese quotations from The Great Learning) confer upon the motto the prestige of antiquity. More importantly, they precisely echo the meaning of the Chinese phrases mingde 明德 and gewu 格物. Sapientia is equivalent to gewu 格物, and virtus to mingde 明德. The motto therefore has similar associations for an educated European as the quotations from The Great Learning have for an educated Chinese. Most coats of arms feature a knight's helmet above the shield. The helmet is normally encircled by a wreath which secures the mantling (originally a cloth covering worn over the helmet to protect its wearer from the heat), and is surmounted by a crest (originally a simple fan of tall feathers worn on top of the helmet to make a knight appear taller and more imposing). Heraldic artists have conventionally shown the mantling hacked to ribbons and flowing upwards in defiance of gravity. The tattered ribbons imply that the owner of the coat of arms was a brave knight, accustomed to fight in the thick of the battle. The upward flow was adopted purely for aesthetic reasons, as it enables the artist to fill what would otherwise be an inelegant void above the supporters. The depiction of the helmet crest has also undergone considerable artistic development. The original fantail has disappeared and the crest has become an extravagant fantasy, which often echoes the design elements of the shield. In the University's coat of arms the helmet, the wreath and the mantling are conventionally rendered. The red and gold of the wreath and the blue, green and gold of the mantle echo the colours used on the shield, in accordance with the principle of balance. The crest features two of the elements that already appear in the shield--the lion and the open book. The College of Arms depicted the lion of England wearing a traditional Chinese jade collar around its neck. Several coats of arms with Chinese associations exist, but this particular feature does not seem to be paralleled elsewhere. In most coats of arms the 'supporters' (so-called because they are depicted as though they are supporting the shield in an upright position) are either animals or birds. In the University's coat of arms the East-West balance is again made explicit. One of the supporters is a Chinese dragon, the other an English lion. To differentiate these supporters from those in the colonial arms of Hong Kong, the College of Arms reversed their relative positions and gave both animals a Chinese jade collar. The supporters stand on separate 'steep mounts' (normally they would stand on a connected piece of land). 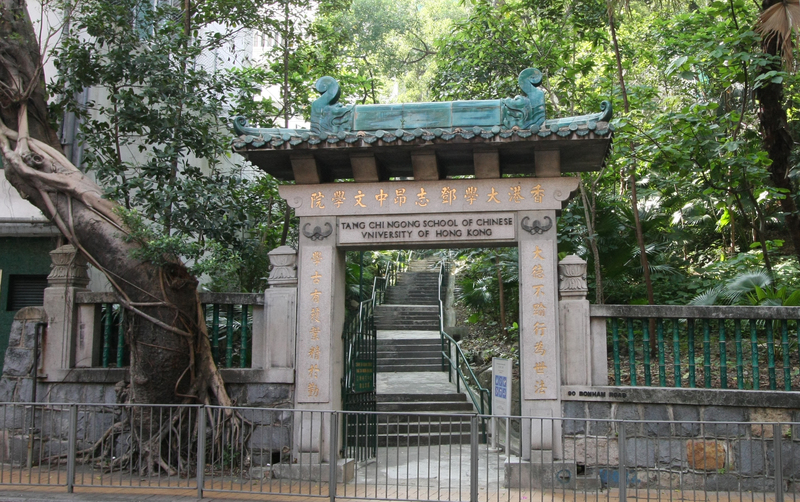 The steep mount is an allusion to Hong Kong Island, where the University's main campus is located. 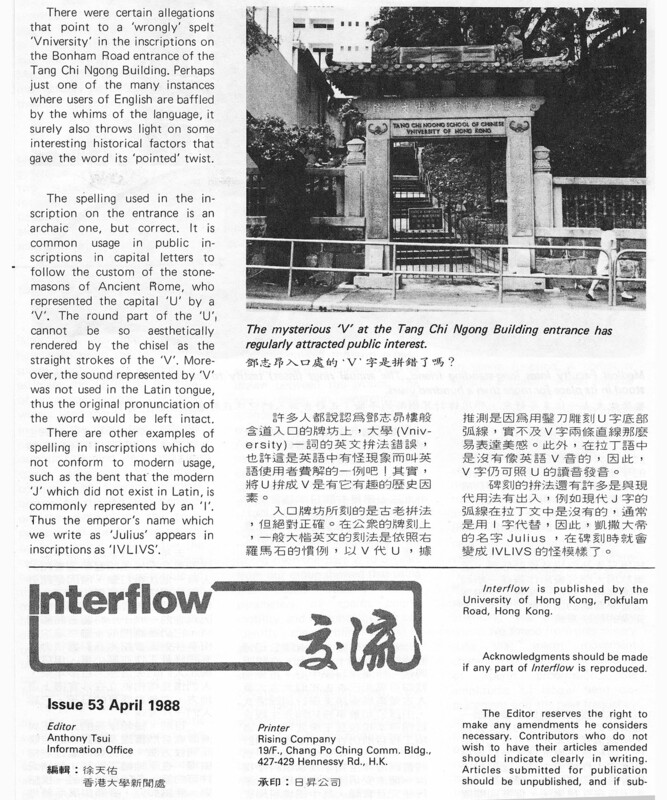 From time to time the University receives comments on this inscription, normally to the effect that the spelling 'Vniversity' for 'University' is an embarrassing mistake which should be corrected as soon as possible, and that it should have been spotted in 1931, when the Tang Chi Ngong Building was completed. In fact the spelling 'VNIVERSITY' was quite deliberate, and was intended to add a touch of academic dignity to the inscription by imitating the style in which Latin words were carved in capital letters.Latin, like English, distinguishes between the vowel 'u' and the consonant 'v', and these letters were normally written just as they are in modern English.The exception was when they appeared as capital letters in carved inscriptions on stone.Roman inscriptions always used capital letters, and the letter U was often represented by V because it was much quicker and easier for a stonemason to make two straight strokes than to reproduce the round base of the letterU.Thus, for example, the name of the first Roman emperor Augustus is usually spelled AVGVSTVS in carved inscriptions.The Romans seem to have found no difficulty in reading V as U in such cases. Although the spelling 'VNIVERSITY' seems rather odd today, the use of V for U in stone inscriptions in English would not have looked out of place in the 1930s.This was a period when the study of Latin enjoyed great prestige, and when appeals to classical dignity and decorum were much more common than they are nowadays.